Informal groups are groups that you are automatically signed in to when you sign in to Lync 2010. When the support team makes you an agent for a response group, you’ll see a notification in Lync that tells you which group you’ve been added to. If your response group membership is removed, you’ll also be notified. 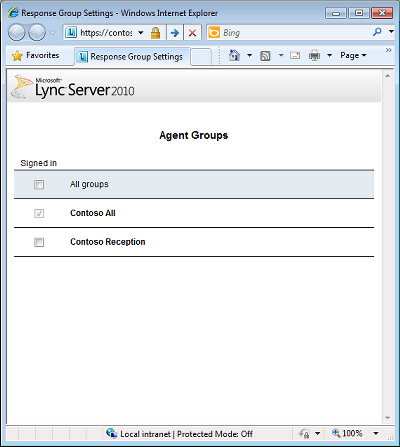 You can use Lync to access the Agent Groupspage, which lists the groups for which you’re an agent. If you are an agent for multiple sites, you get a separate page for each site. Open Lync, and, in the Lync main window, click the Show Menu arrow ( ), point to Tools, and then click Response Group Settings. A browser opens and displays the Agent Groups page, which lists all the groups for which you’re an agent. A checked box indicates that you are signed in to a group. To sign in to a formal group, select the Signed in check box next to the group. You cannot clear the Signed in check box for informal groups. 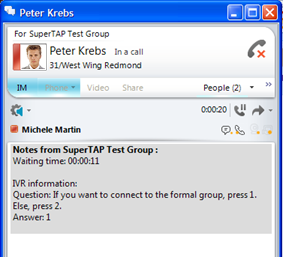 Groups marked as “n/a” indicate that the Agent Groups page cannot connect to the Response Group application. Note: The Response Group application cannot route calls to agents who have Privacy Mode enabled. To receive Response Group calls, either disable Privacy Mode or add “RGS Presence Watcher” as a Contact. When you’re signed in to a group, you’re ready to take a call. An incoming call notification shows you which group is routing the call to you. To answer a call, click the incoming call notification. If you’re answering a call for an anonymous response group, your identity remains hidden from the caller. After you answer a call, a conversation window opens. At the top of the window, you can see the name of the response group that routed the call to you. If it’s an anonymous response group, your identity is hidden during the call, and the word “Anonymous” appears in the top right of the window. Instant messages exchanged during an anonymous response group conversation also preserve your anonymity. If the caller was given options when he or she first connected, the conversation window shows Notes from the (group name) along with the instructions the caller heard and the option the caller selected. You can also see how long the caller waited to connect to you. Other Lync users can search for a response group the same way they search for any other contact. They can call the group directly from Lync. If your support team has enabled the agent anonymity feature, your name won’t appear in the Lync conversation window when you answer a call, so your identity remains anonymous.